Well I hope the link works… I think I’m up before ShaMoo and J-B. I’m not sure either! :) I’ll have to have a “blogging 101” night for you guys one of these days! heehee! I fixed it. She scares me just a little bit, Jim. ROFLMAO. Don’t get between her and food. LOL. I know plenty of hims where the same rule applies. LOL. Great haikus. Slightly off-topic, my post “feeds” the soul, I think! You went for the wine in your haiku, I went for the bread! Your haiku are straight from the couch. i didn’t do a food haiku because i am too busy hating food right now. “scuse me my cookies are done. Psych’s couch, Nessa? ;) I hate food too… and it’s not far that it doesn’t show!!! Ah, Jenn, you know me so well!! Yes, food is a pretty damned serious thing with me. Love your haiku today, darlin’!! Ever at war, so so so right! great one this week Jenn! Ah yes…the love-hate relationship with food. Definitely a theme here! 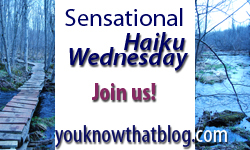 :) Love your haiku…as always. Jenn…thanks for the heads up…comments are now fixed! I wasn’t sure I’d get inspired for this one today, but I did … with some very mundane details of my life. ;-) Thanks for the prompt! The loving and the hating and the never done with it. Good one. I’m afraid I won’t pass up food until I’ve got no teeth left to chew. So sad That I did not participate this week!! Wasn’t feeling too well…See you wednesday!